Humans shed about 30,000 to 40,000 dead skin cells every hour. In some people, the cells fall off faster, even before they are dead. The fallen cells are replaced by new cells. When an immature cell sheds off, the body covers it up with scales. Sometimes, due to altered immunity, abnormal and excessive scaling continues forever. Psoriasis, an auto-immune disease, is characterised by scaling due to abnormal speed of multiplication of cells. Psoriasis is estimated to affect about one to three per cent of the Indian population. The treatment for the disease is expensive, and often, ineffective. Hence, steroids are used. Some injections for psoriasis cost about Rs 4 to 5 lakh a year, and most patients cannot afford it. The injections can also have serious side-effects, like reactivating latent infections such as tuberculosis. Some forms of psoriasis, like scalp psoriasis and nail psoriasis, are notoriously difficult to treat. A group of scientists at Atrimed Pharmaceuticals, Bengaluru, have been working on a cure for many years. Dr Hrishikesh Damle, MD and CEO of Atrimed Pharma, and his team made a breakthrough three years ago when they found out that certain plant molecules can inhibit the proteins that trigger psoriasis. Treatment involving these molecules resulted in remission of the disease. Animal studies and clinical trials corroborated their findings. India is home to about 40,000 species of plants. Of these, around 3,000 species may have been used by humans. 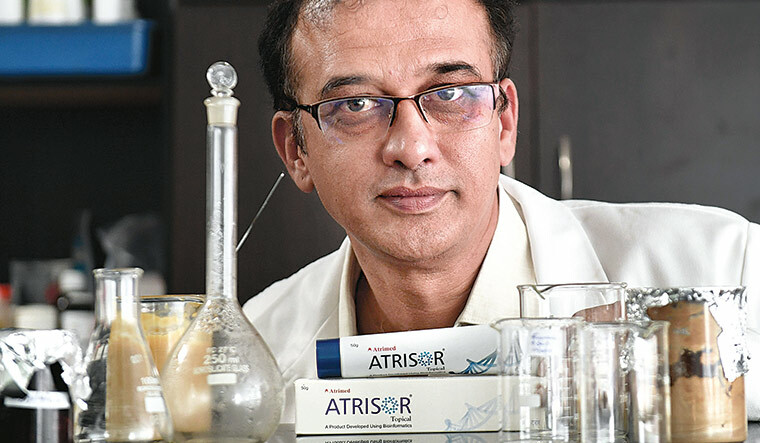 The result: Atrisor, an affordable medicine that costs less than Rs180 a month. Created from ingredients from many plants, including neem, turmeric and coconut oil, Atrisor offers great hope for people with psoriasis. “I don’t claim that I can cure psoriasis. But I can assure a complete remission. It works well in people with moderate psoriasis and does not cause side effects like steroids do. For some patients, it is found to be more effective than steroids—the symptoms go off completely,’’ says Damle, choosing his words carefully. The medicines are available in different forms—cream, shampoo, scalp lotion and moisturiser. They are easy to apply and are reasonably priced; both factors improve compliance. “Our medicine works differently in different ethnicities. It works well on Indians and Caucasians, but not on the Chinese. We don’t know whether it is because of the food or climate or because the disease presents differently in them,” says Damle, who holds a bachelor’s degree in ayurvedic medicine and surgery and an MD in plant pharmacology. Damle and his team are now trying to develop oral medicines for psoriasis. Atrimed Pharma has also come up with plant-based medicines for acne, fungal infections and skin pigmentation. “Our lab is also focussed on developing medicines from plants that can support chemotherapy and make our own immune system kill cancer cells. We are also in an advanced stage of research in controlling pain with a preparation, which is as good as aspirin,” says Damle.